At the ground level we have 2 one bedroom flats Anubis and Seth, these have an open plan lounge/kitchen, a shower room and a bedroom. This is the full collection of our flats to date, you can have a look at their availability. Some are on long term leases or have resident owners so are not always available for holiday rental but the availabilty page is always up to date if you want to check. 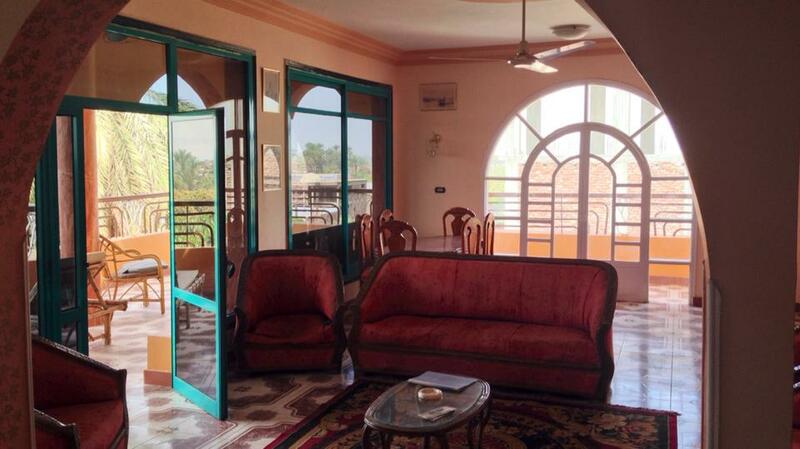 These one bedroom apartments are situated in the Flats in Luxor East Bank building. This is located in the heart of tourist town. The street, which is unnamed (don’t worry, we transfer you on your arrival for free! ), is off Khalid Bin Walled street which is the main street housing the Sonesta, Nile Place, St Joseph, Gaddis hotels. This side street is opposite the Isis Pyramisa and has the shops MobilNil is on one corner and BNP Paribas on the other. The side street used to be a cul-de-sac but recently access was made to Medina Street but it is still little frequented so an oasis of calm in the middle of busy Luxor. We have members of staff on the premises 24/7 and they maintain the communal areas, provide security and will run errands or help with translation. This was the second apartment block we built and was complete in 2005. 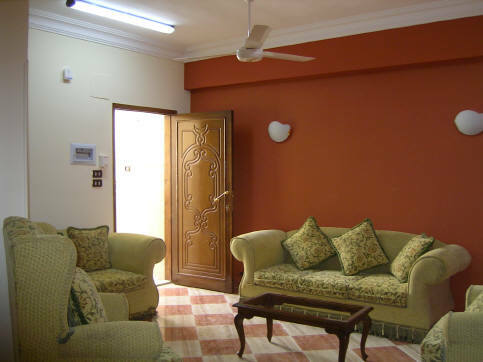 It comprises three apartments with three bedrooms and two apartments with one bedroom. The one bedroom apartments are on the ground floor making them ideal for the less mobile. 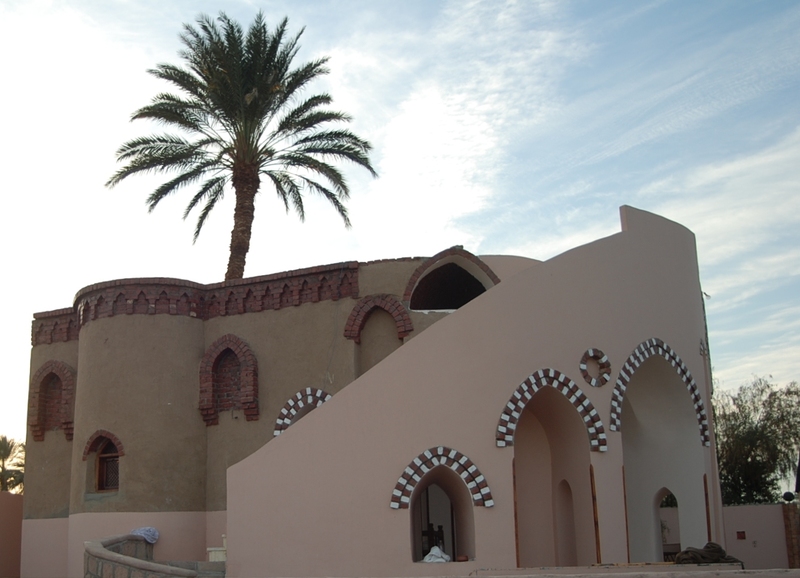 Luxor has a limited nightlife and for those wishing to enjoy it this location is ideal being within reach of western style restaurants, bars, hotels, discos and other night time attractions. 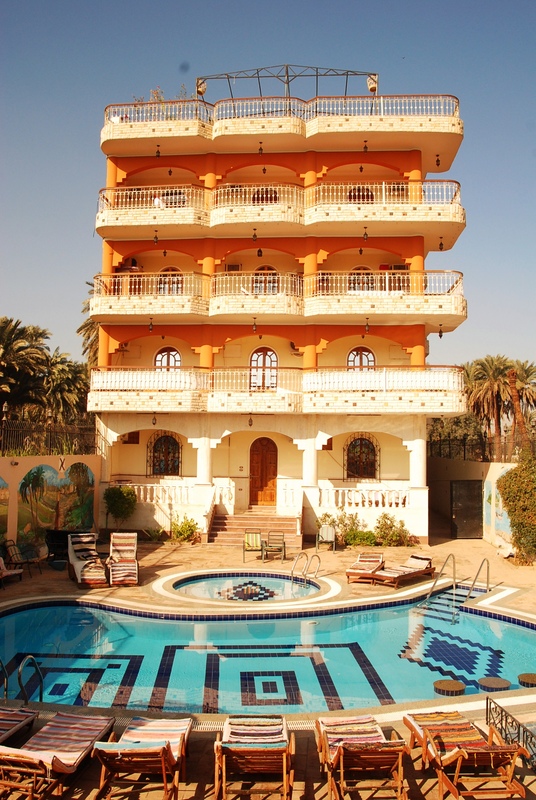 Just across the Nile River you have all the cultural attractions of tombs and temples. The flat itself consists of one separate bedroom, a shower room and an open plan kitchen and bathroom. This is the layout of both Anubis and Seth. 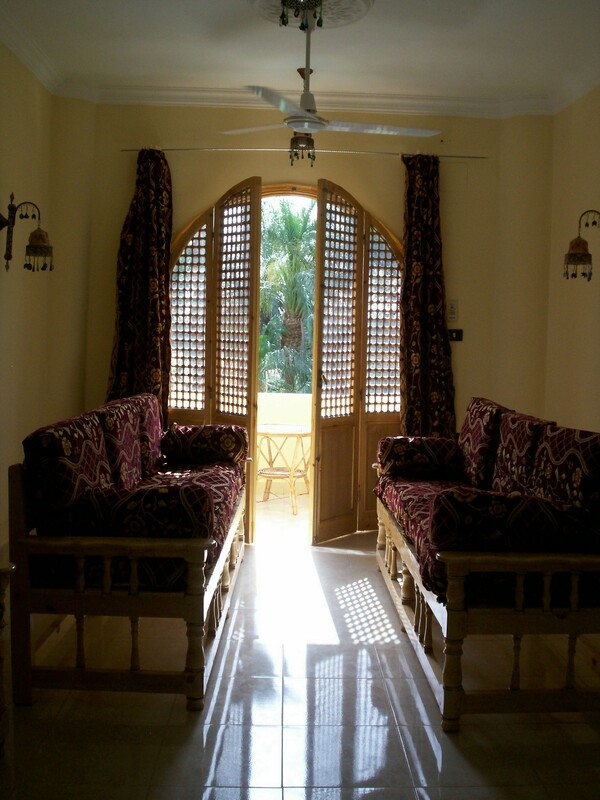 Ideal for a single person or a couple, we often have long term rentals in these apartments from people working or studying in the area. There is a roof terrace for the use of all the apartments in the building. During exceptionally busy periods like Christmas we may be fully booked but can still find accommodation for you in our overspill, so don’t be afraid to email your requirements or book “To Be Allocated”. Want to have a look at pictures of some of our overspill flats?, try the Flats in Luxor blog.